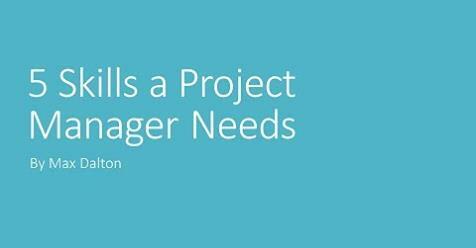 In this article I'm going to talk through five skills a project manager needs, project management is an art form and no one becomes good at it overnight good, Project managers have lived through failed projects taken their lumps and learn from their mistakes If you are considering becoming a project manager there are five core skills you can work on that will give you a good start in getting out of the gate. The ability to clearly communicate is the most critical skill for a project manager to have and it can account for upwards of 90% of a project managers time this communication can come in the form of both written and oral communication examples of written communication that a project manager will be responsible for include meeting notes general email correspondence for the project and weekly status updates. Examples of oral communication you can engage in as a project manager include presentations associated with your project leading team meetings conversations with stakeholders and conversations with team members. Project managers often have to juggle multiple projects of various sizes that means staying on top of all the schedules financial tracking communication and individuals doing the work for each project as a result it's critical for project managers to have strong organizational skills to not just stay on top of all their work but also to be able to monitor what everyone else is doing and where everything. Into a quick base and many more, it's also important to try different tools to find the right combination that works best for you. Project managers regularly find themselves in the position of negotiating contracts, as a result, it's important for them to understand the importance of soliciting bids from multiple vendors how to identify what their positions strengths are that they can leverage when negotiating terms and the strengths and weaknesses of various contract types. For example fixed bid firm, fixed price cost plus six fees and more so that they can pick the one that works best for the business. Another important skill a project manager should have that will come into play when negotiating a contract is the ability to review statements of work this is important to ensure that all of the work the business is looking to get done is outlined and accounted for and also to, make sure the vendor you're working with isn't gold plating or unnecessarily increasing the scope of the work the business is looking to have done. Project managers routinely find themselves in the position of leading large groups consisting of people from different departments who are tasked with doing something that no one knows exactly how they're going to do it the project manager's job to get everyone to work together to define how they are going to execute the project they are tasked with ensure that everyone is clear about their work assignments and then to keep everyone engaged and on track until the work is done as a result being a project manager requires the ability to stay calm and collected in tough situations helping other people work through problems being able to lift other people up and make them feel like an important part of the team leading by example and having a high level of integrity. One of the most difficult aspects of project management can be managing risks, a project manager must work at the beginning of a project with individuals and all levels of the business, some who may not even be on the project team to identify risks to a project to further. Complicate matters there are all kinds of directions to consider when looking for risks to a project there can be internal risks associated with other company initiatives there can be risks associated with vendors that can be risk associated with government regulations and on additionally for each risk that gets identified it's the responsibility of the project manager to both outline how to control that risk to prevent it from happening and also to pull together options for that risk should be addressed if it turns into an actual issue and that process of risk analysis doesn't stop after the initial assessment but it is ongoing throughout the duration of the project.